Ernie gets physical in his first commercial appearance in the Big Game. 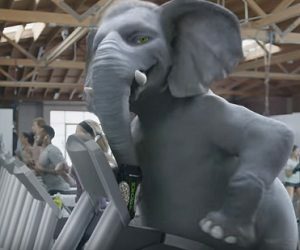 The Wonderful Pistachios famous mascot stars in the brand’s Super Bowl ad breaking the treadmill after revealing that he’s recently discovered the Pistachios are a good source of protein. With a bag of Wonderful Pistachios at his hand, on the treadmill, he runs (or at least he’s trying to), but a few steps are enough for him to lose his balance and fall down. When he gets up, he points the finger to the respective treadmill, saying that “that one is broken”. The 15-second spot ends with the brand’s tagline, “Get Crackin'”.